Building Trades Maintenance involves knowledge of multiple trades and skills necessary to maintain residential buildings, factories, offices, schools, and hospitals. Trades involved include: masonry, carpentry, roofing, glazing and caulking, plumbing and pipe fitting, heating and air conditioning, electricity, welding, and machine maintenance. What Qualities Should I Have? Due to the nature of repair work, you should be able to work for extended periods of time. You should also be the type of person who strives to learn about the many trades you will be required to know for maintenance. Basic math and reading comprehension skills along with a strong willingness to learn new skills is crucial for a student entering the program. Carpentry and Construction involves a variety of jobs including building the framework for homes, erecting walls and roofs, installing doors and windows, flooring, cabinetry, wood paneling, molding, and ceiling tiles. Construction jobs done by carpenters include remodeling, maintenance repair work, prefabricating buildings, constructing new buildings, and building forms to hold concrete at residential and commercial building sites. 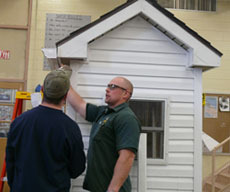 The duties of carpenters vary by the type of construction, type of company, skill of carpenter, and size of community. You should be able to visualize from a blueprint what a proposed project will look like and construct it to the designed specifications. 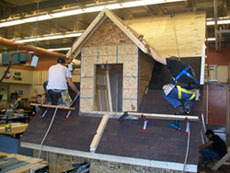 As in other building trades, the work is active and sometimes strenuous. You are required to stand for prolonged periods and should be able to climb and squat. Good muscular dexterity is required. Certain jobs will require you to work in fair or inclement weather. You should also have a good working knowledge of mathematics. Electricity encompasses a wide variety of electrical skills and many theoretical concepts. One important part of the electricity curriculum is residential wiring. 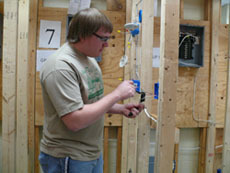 Students will be taught how a home is wired from start to finish. In conjunction with learning these valuable wiring techniques, the National Electrical Code is also taught. Electricity deals with commercial and industrial electrical systems as well. As a student, you will learn such skills as blueprint reading, motors and generators, transformer work, and working with motor control circuits. The electricity laboratory boasts a high-tech array of computerized motor control training equipment. The student aspiring to be an electrical technician or engineer can gain up-to-date experience in dealing with programmable logic controllers and variable frequency AC motor drives. You will often be required to climb ladders or work on scaffolds. During a single day, you may repair equipment in both a clean, air-conditioned office and on a factory floor. It is essential to be alert and accurate at all times. You should enjoy working indoors most of the time. You should also recognize the critical importance of shop safety, patience and perseverance in troubleshooting, and diagnosing electrical and electronic circuits. HVAC/R technicians often specialize in either installation or maintenance and repair, although they are trained to do both. They also may specialize in doing heating work or air-conditioning work or refrigeration work. Technicians follow blueprints or other specifications to install oil, gas, electric, solid-fuel, and multiple-fuel heating systems and air-conditioning systems. Technicians also install and maintain heat pumps, Geo Thermal heating systems and commercial refrigeration equipment. Technicians must use care to conserve, recover and recycle the refrigerants used in the HVAC/R Field. The Heating, Venting, Air Conditioning and refrigeration program is designed to prepare the students to be successful in the field and to go on to college. The program is based on theory and practical hands on learning. Work ethic, communication skills and safety related to the field are also stressed. Students in 10th, 11th and 12th grade will spend approximately 1200 hours learning this field and demonstrating his or her skills. 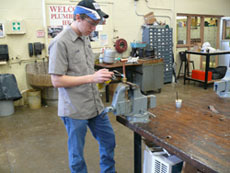 As a student, you should be mechanically inclined and able to deal with high school level mathematics. HVAC/R is demanding work. You should be able to do a lot of heavy lifting, stand for long periods and work in outdoor environments. Sometimes you will be required to work in cramped and dirty places. You should enjoy working with your hands and above all, display a high degree of interest in this field. Copyright © 2019 Columbia-Montour AVTS. All Rights Reserved.